I found Rebekah’s visual guide to planning for writing workshop tremendously helpful, and I know many of you did, too. In an effort to be transparent and share the systems that work for us, this week I am going to write a little bit about the various organizational tools that help my workshops run more smoothly and keep the materials my students and I need at our fingertips. For a year or two I tried to go completely paperless. I condensed dozens of binders (one for each study or unit) into two or three by making or finding digital copies of everything. I forced myself to move conference notes online, and I asked the students to set up digital writing folders. At first, I loved how much space a purely digital system opened up in my room. Our classroom unfettered by papers, thick 2-inch binders, and handouts, we had more room to think. However, I also found that we sometimes wasted time trying to locate essential papers since they weren’t right at our fingertips — and sometimes I just needed to write something down on a piece of paper and save it. Over the past two years, I have refined my system — it’s about 75% digital and 25% analog. The trick is keeping hard copies of what’s essential, and letting a digital binder house everything else. As you can see from the picture, my Master Binder is nothing fancy — a simple, white, 1-inch binder with different sections for each of the classes I teach and a copy of our school schedule tucked into the front clear pocket. Within each class section, you’ll see four subsections: handouts, mentor texts, rubrics/checklists and rosters/conferences notes — tools that correspond with the components of writing and reading workshop. Sections and sub-sections in the Master Binder. 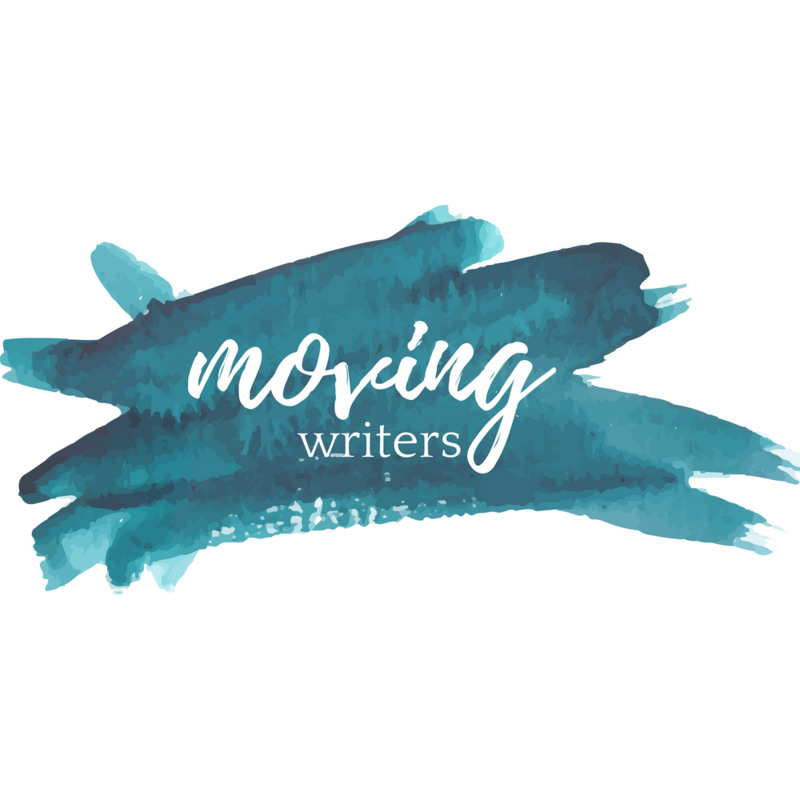 Reading and Writing Workshop Rules and Guidelines — I modify the rules and guidelines Nancie Atwell shares in In the Middle. If a student is not using time or space wisely during workshop, I simply bring my binder over to her desk, point to the rule or guideline she is not following, and remind her of the expectations. Colorcode each study overview (in your binder and in students’ binders) so everyone associates each study with a particular color and can find the relevant handouts more easily. Put the Rules and Guidelines handout in a sheet protector since you distribute it during the first week of school and refer to it throughout the year. Almost all of the instruction in my class stems from mentor texts — from the work of real writers. We refer to them every single day of the year — sometimes briefly, sometimes for the full class period — so it’s important that they remain at my fingertips. A mentor text from our Letter to the Editor study. After you are done with a study, consider filing your personal copies of the mentor texts in a larger binder that you can tote around with you for cross-genre mentor text work in conferences. In this section I keep my stash of rubrics and writing checklists from every single writing and reading study from the year. When conferring, I can turn to a rubric or checklist, point to a skill, and ask a student to show me evidence that he is trying the work of the mini-lesson and working this skill into his writing. This section also serves as a quick reference for where we’re headed in the unit — one that I can show a student, a parent, or even an administrator who is interested in what we’re up to. Consider using this section to plan for future writing studies. With a list of all of the skills you’ve previously taught in front of you, your planning will be easier and better connected to the students’ prior knowledge. The last section of my master binder houses a handful of rosters where I write conference notes and/or status of the class updates. The spreadsheet I use is nearly identical to the one Nancie Atwell shares in In the Middle — a simple chart with names printed horizontally and dates printed vertically. 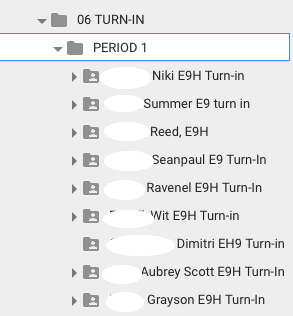 I print 8-10 rosters for each class at the beginning of the year, so I never have to print another during the year. They are ready to go when I need them at the beginning of a new study. On this conference record, I recorded students’ individual goals/plans for the day during roll call. In the past I’ve tried various digital applications — a Google Doc, Confer — but I found it difficult to type my notes and listen to students at the same time. Even an iPad or phone felt cumbersome, though not as difficult to manage as a laptop computer. Although I desperately wanted to find a digital system that worked for my students and me, I have found that handwriting notes is the best way to focus on what a student is saying and be able to develop a timely, appropriate response. For rosters/conference notes, it’s important that student names run horizontally and the dates run vertically. It’s much easier to view student progress in a workshop when you can read down a column detailing their daily goals and accomplishments. My students “turn in” their independent reading every Friday. In class, they report what they are reading and how many pages they read during the week. They also have the opportunity to check in with their quarterly reading goals. Last year the student reading log was digital, and while it was tremendously useful for me, the students reported that it was cumbersome, and many didn’t complete it on time. 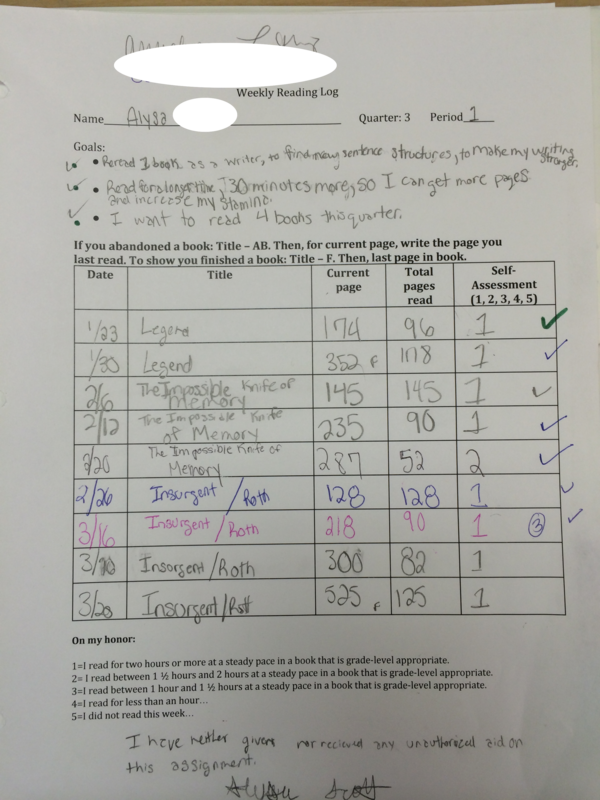 As soon as I switched over to a paper log, completion rates increased, and students reported that they felt more connected to their reading because they could see their progress on a daily basis (with the digital reading log, all of the data came to me and was stored in one of my Google Docs folders. Students had to ask to see it or keep a record of their own if they wanted a visual of their progress). Each student has his or her own reading log — one per quarter — and all of these logs are housed in another simple white binder that travels around the room during reading time. They are filed alphabetically by last name, and for particularly large classes, I use alphabetical binder dividers to organize the section so students can access their individual logs as quickly as possible. Supplement the paper log with a digital reading log like this one for snow days and other holidays when students aren’t in school to report their reading progress. Students won’t necessarily look at their goals just because they are printed at the top. Every few weeks, ask them to write about the progress they are making towards the goals. Allow them to revise their goals directly on the log as they learn more about what they are capable of and what time will allow. Every student has her own turn-in folder — a place where she keeps all drafts of a paper, as well as checkpoints and other relevant materials. At the beginning of the year, I ask students to watch this video tutorial for homework and set-up their turn-in folder before class the next day. If students title their folders correctly, they will be shared with the teacher in alphabetical order. 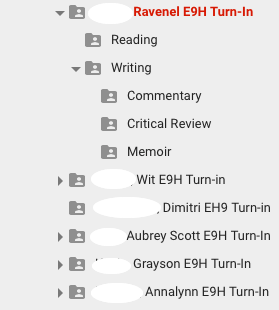 Student turn-in folders in my Shared Google Drive, in alphabetical order by last name. Within each student turn-in folder, I ask students to create subfolders for Reading and Writing, and smaller folders for each of the units of study within these broader subjects. 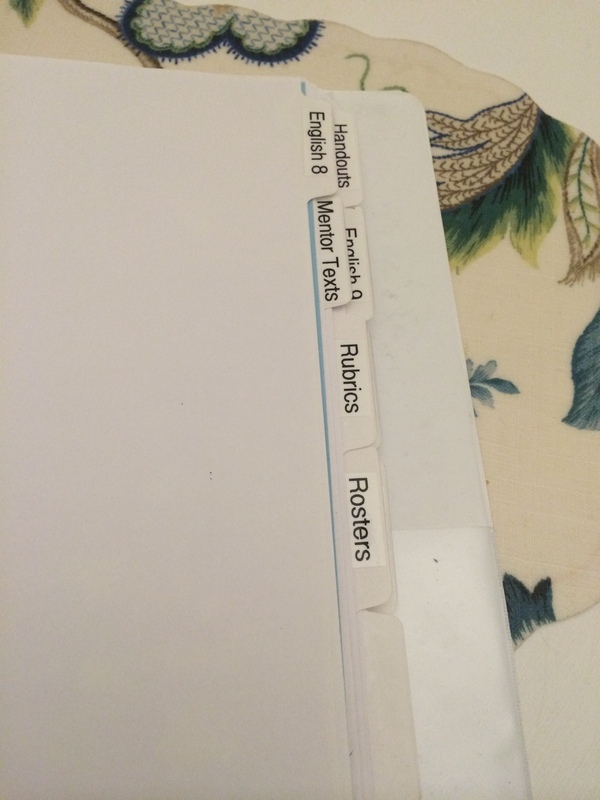 It’s very easy to locate a student draft when folders are organized in this way. The contents of Ravenel’s turn-in folder. Finally, in my own Google Drive folder, I have a separate folder for each subject I teach. This shared folder replaced the old Master Binder I used to keep of every single handout, Powerpoint, reading, etc. that I gave to students. 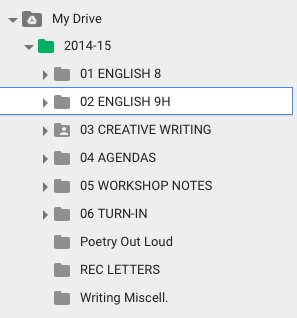 Students have access to this folder in their Google Drive (under Shared). They can also access it through a link on my class website. 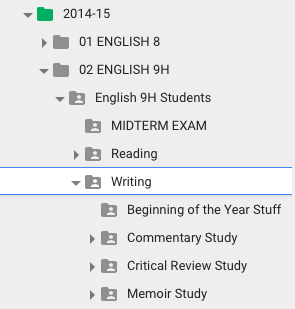 My Google Drive for 2014-15 school year. This folder mirrors the students’ turn-in folder: every unit of study has its own folder, so students can quickly access materials relevant to the current study. Sub-folders of my Google Drive that correspond to student turn-in folders. 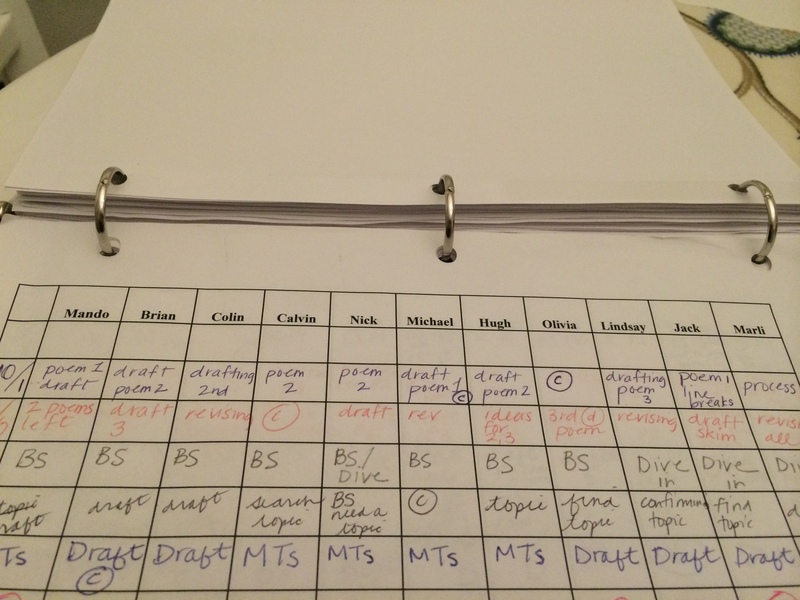 As I prepared this blog post, it struck me as interesting that a teacher’s master binder tells a story about her classroom — about her philosophy, the structure, and the work she and her students are doing. What story does your binder tell? No system is perfect — and even the best systems inevitably get tweaked over the years as new tools are released and the shape of our work changes. One thing’s for sure, though: sharing systems with one another ultimately leads to better organization for all. So, in the spirit of sharing, please leave a comment below or find us on Twitter @ allisonmarchett @rebekahodell1 and tell us about the tools that help you keep your classroom workshop organized and running smoothly! Great tools to help facilitate effective writing workshop model! Great ideas, gals! Something we’ve done with teachers is push them to create Anchor Charts from the most critical mentor texts in the unit. So…use only the MAJOR pieces. After the work of reading and digesting these pieces, we turn them into BIG posters and refer to them in the units. Imagine an 11X17 copy of the text in the SMACK DAB middle of the gigantic chart paper or Post It sticky paper. 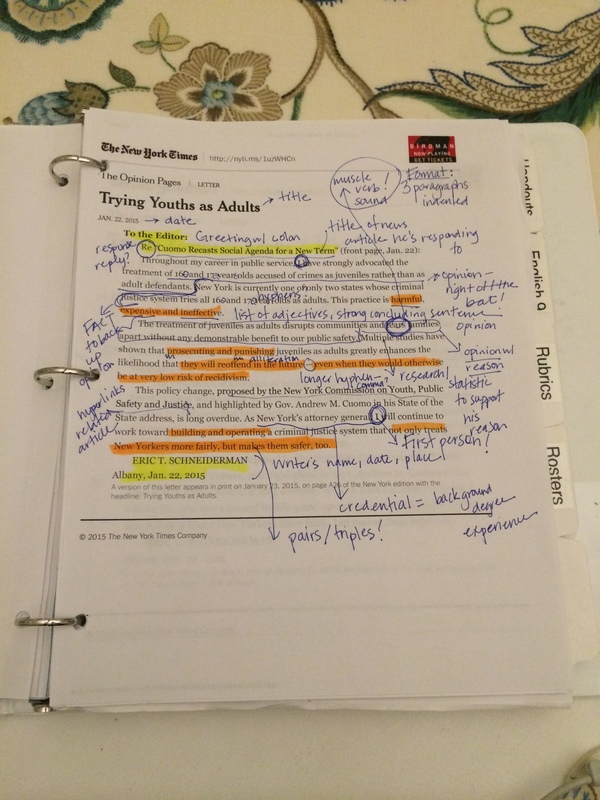 Then all of the highlighting extends to the outside and is written largely, so students can see it across the room. We’ve had teachers put them right near their group conference table, so when they are having a small group they can refer to the poster. It’s also a good place to stand for mid-workshop checks (we usually keep these once in a while…and only if greatly necessary…we do not like to interrupt the writing flow). If you notice several students forgetting to try-on a particular thing from the text, point them back to the anchor chart.